Find device-specific support and online tools for your BlackBerry Z10 smartphone. Learn how to use My Verizon to bring your own device (BYOD) to a new or existing line on your account. Learn how to set up your new smartphone with important features and functions. Get the most out of your new phone with this list of practical tips. Watch this video to learn how to activate a new device, or switch between devices, on your existing My Verizon account. Learn how to swap numbers quickly between two devices on your account using My Verizon. Get instructions on how to order a new sim card. Watch this video to learn how to switch your device with another person on your account. Discover how to set up your BlackBerry ID to access all the special features on your BlackBerry Z10. To transfer or move music files/songs between your device and a computer/PC, use this info. To transfer/move/upload picture or video files between your device and your computer/PC, view this info. Here's how to move content from one BlackBerry device to another via BlackBerry Desktop Manager. To transfer or move music files/songs between your BlackBerry Z10 and a computer/PC, use this info. Learn how to turn your BlackBerry Z10 smartphone on and off. Information about wireless charging with your mobile device. Here's info on the battery specs (e.g., Use Time, Standby Time, etc.) for your BlackBerry Z10. Here's some support info for beeping or audible tones while using Bluetooth headsets. To connect your vehicle to a Bluetooth-enabled device, here's a list of auto manufacturers' URLs for more help. Learn how to pair your BlackBerry Z10 with your Bluetooth device. Learn how to wirelessly send photos using Bluetooth with your BlackBerry Z10. To make your BlackBerry Z10 visible to Bluetooth devices, view this info. Discover how to access and close open apps on your BlackBerry Z10. Learn how to set up a meeting with your voice on your BlackBerry Z10. Make and receive calls over a Wi-Fi network if cellular service isn't available. Enjoy free calls to any number in the US even while traveling internationally. Here's how to remove a temporary call or message block via the My Verizon website. Here's how to temporarily block unwanted calls and messages via the My Verizon website. Here's info on rates and dialing instructions for international calling from inside or outside the US. This may help if you're having trouble sending a picture/text message. If you're having other issues with your device, visit our Troubleshooting Assistant. These walk you through solutions for issues you may have with your device. Here's how to block text messages originating from email addresses or domains via the My Verizon website. Learn how to assign a ringtone to a contact on your BlackBerry Z10. Learn how to ignore a call and reply with a text message using your BlackBerry Z10. An interactive guide on how to place a call to a contact using your BlackBerry Z10. Learn how to use your BlackBerry Z10 to place a call to a new number. Learn how return to a call on your BlackBerry Z10. Learn how to switch between calls on your BlackBerry Z10. Learn how to teach kids to dial 911 on your BlackBerry Z10. Discover how to view a missed call and add it as a contact on your BlackBerry Z10. Discover how to write call notes on your BlackBerry Z10. Learn how to adjust the video setting for sharing on your BlackBerry Z10. Learn how use to Burst Mode with the camera on your BlackBerry Z10. An interactive guide on how to change the camera from rear to front-facing on your BlackBerry Z10. Discover how to change the camera from rear to front-facing on your BlackBerry Z10. Learn how to record a video using your BlackBerry Z10. Learn how to share photos using your BlackBerry Z10. A visual guide to sharing videos on your BlackBerry Z10. Learn how to take a picture using your BlackBerry Z10. Learn how to use Time Travel Mode with the camera on your BlackBerry Z10. An interactive guide on how to turn the flash for the camera on using your BlackBerry Z10. Learn how to zoom in and out for video on your BlackBerry Z10. Discover how to zoom in and out with the camera on your BlackBerry Z10. This helps import contacts/numbers to Gmail from a saved file (.csv). If you're having other issues with your phone or device, visit our Troubleshooting Assistant. These walk you through solutions for issues you may have with your device. Here's how to export contacts from your Gmail account to a CSV file. How to transfer contacts on BlackBerry® devices without Backup Assistant. Here's steps on how to import and export contacts to your Macintosh computer. Here's how to see where your contacts are displayed or if your phone is displaying duplicate contacts. Here's how to import your contacts into Microsoft Outlook using a CSV file. Learn how to add a contact to your contact list on your BlackBerry Z10. A step-by-step guide for adding and deleting contacts from your favorites list on your BlackBerry Z10. Discover how to assign a picture to a contact on your BlackBerry Z10. Learn how to create a group and add contacts to it on your BlackBerry Z10. Learn how to share a contact's information using your BlackBerry Z10. If you can't connect to the internet or send or receive email, text, pics or videos, view this info. If your BlackBerry Z10 shows the incorrect date and/or time, view this info to correct it. How to locate the ESN or MEID number on handsets. If the display on your BlackBerry Z10 doesn't rotate, this shows how to fix it. Learn how to access the settings on your BlackBerry Z10. Learn how to change the ringtone on your BlackBerry Z10. Discover how to minimize apps on your BlackBerry Z10. A visual guide for setting screen security to help keep others from accessing your BlackBerry Z10. A visual guide for setting your BlackBerry Z10 to silent. An interactive guide for setting your BlackBerry Z10 to airplane mode. Learn how to use the keyboard on your BlackBerry Z10. Here's how to create a Gmail account. Here's how to reset your Google/GMail account if you are having problems. Here's how to permanently block text message spam sent from email addresses, domains or text nicknames. Here's info on personal email settings for your BlackBerry Z10. Learn how to forward an email on your BlackBerry Z10. Learn how to add an attachment to an email with your BlackBerry Z10. A visual guide for replying to an email on your BlackBerry Z10. A step-by-step visual guide for sending an email using your BlackBerry Z10. Learn how to set up a business email account on your BlackBerry Z10 so you can keep up with work wherever you go. Discover how to set up a personal email account on your BlackBerry Z10. Discover how to switch between email accounts on your BlackBerry Z10. Here's how to add a personal email account by manually entering server info on your Z10. Removing then re-adding a work email account on your Z10 often fixes email issues. Removing then re-adding an email account on your Z10 often fixes email issues. To add a work email account on your Z10, view this info. Learn how to locate a lost or stolen device. Find instructions for using a recovery method for your phone or tablet. Review information about calling 911 from your mobile phone. If your screen looks different, here's info on how to return it to its original setting. An interactive guide on how to organize apps into a folder on your BlackBerry Z10. An interactive guide on how to delete a folder on your BlackBerry Z10. To turn Mobile Hotspot on/off on your BlackBerry Z10 or if you can't connect to Wi-Fi, see this. Discover how to set up mobile hotspot security on your BlackBerry Z10. This often fixes issues with receiving email and other data connection issues on your BlackBerry (BB). If you're having other issues with your phone or device, visit our Troubleshooting Assistant. These walk you through solutions for issues you may have with your device. If you're having trouble connecting to the Internet or a web page won't display on your device, follow these steps. If you're having other issues with your phone or device, visit our Troubleshooting Assistant. These walk you through solutions for issues you may have with your device. If you can't browse the Internet or view website images on your BlackBerry Z10, view this info. If you're having other issues with your phone or device, visit our Troubleshooting Assistant. These walk you through solutions for issues you may have with your device. Learn how to bookmark a website to easily find it again later on your BlackBerry Z10. Discover how to navigate to a website on your BlackBerry Z10. A visual walkthrough of opening a new window in the web browser of your BlackBerry Z10. Learn how to read websites later on your BlackBerry Z10. Discover how you can use your voice to search the web on your BlackBerry Z10. Discover how to switch between windows in the web browser of your BlackBerry Z10. You can use voice input on your BlackBerry device to type hands-free instead of using your keyboard. If you're having other issues with your phone or device, visit our Troubleshooting Assistant. These walk you through solutions for issues you may have with your device. To change the method used to lock or unlock your BlackBerry Z10, view this info. To unlock the screen on your BlackBerry Z10, check out this info. Learn how to unlock the screen of your BlackBerry Z10. View this info on memory card formatting options for your BlackBerry Z10. A visual walkthrough on how to insert a microSD card on your BlackBerry Z10. An interactive walkthrough on how to remove a microSD card from your BlackBerry Z10. Learn how to get Apple Music with select Verizon Plans, including who's eligible, how to sign up and how to use the Apple Music app. Here's how to add Apple Music from the My Verizon website. Here's how to add Apple Music from your My Verizon app. An interactive guide on how to add a Home Screen on your BlackBerry Z10. 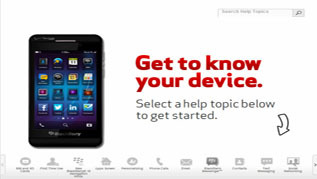 Discover how to find more help like tutorials and videos for your BlackBerry Z10. An interactive map of the buttons and Home screen of your BlackBerry Z10. A visual guide for swiping between Home Screens on your BlackBerry Z10. Learn how to use NFC on your BlackBerry Z10 to wirelessly share content. Get instructions on how to download the latest software update for improvements and fixes to your device. Learn more about the BlackBerry Operating System, including upgrade information, features, benefits and support resources. To check for or to install software updates on your BlackBerry Z10, view this info. Here's how to view the software version your BlackBerry Z10 is running.. Learn about 4G LTE SIM cards, which are necessary for using our 4G LTE network with your mobile device. Discover how to insert a micro SIM card on your BlackBerry Z10. Learn how to remove a micro SIM card on your BlackBerry Z10. Discover how to use voice control on your BlackBerry Z10. To utilize the speakerphone functionality on your BlackBerry Z10, view this info. Here's what the signal indicator means on your 3G BlackBerry. Learn about sending and receiving texts, including how to block unwanted texts, restore deleted texts and troubleshoot issues. Learn about sending a text message to a non-mobile phone, including how much it costs and how the recipient will get the message. Here's how to troubleshoot sending an international text message. To receive delivery confirmation for messages sent from your BlackBerry Z10, view this. Learn how to add a BlackBerry Messenger™ contact on your BlackBerry Z10. Discover how to attach a video to a text message on your BlackBerry Z10. Learn how to forward a text message from your BlackBerry Z10. Learn how to invite others to join you in a BlackBerry Messenger™ chat on your BlackBerry Z10. Discover how to join a BlackBerry Messengertrade; group on your BlackBerry Z 10. Learn how to peek at chats in BlackBerry Messenger™ on your BlackBerry Z10. Discover how to ping a contact in BlackBerry Messenger™ on your BlackBerry Z10. Learn how to reply to a text message from your BlackBerry Z10. Learn how to send a text message on your BlackBerry Z10. An interactive guide on how to send a text message to a group using your BlackBerry Z10. Discover how to start a chat session in BlackBerry Messenger™ using your BlackBerry Z10. Discover how to send a text message using your voice on your BlackBerry Z10. To change the TTY settings on your BlackBerry Z10, check out this info. Discover how to change the wallpaper on your BlackBerry Z10. Learn how to use pictures as the wallpaper on your BlackBerry Z10. To remove a saved Wi-Fi network from your BlackBerry Z10, view this info. Learn how to use your BlackBerry Z10 to connect to a Wi-Fi network. View this info if the Wi-Fi network you want to add to your Z10 doesn't display. Here's how to view signal strength on the BlackBerry Z10.